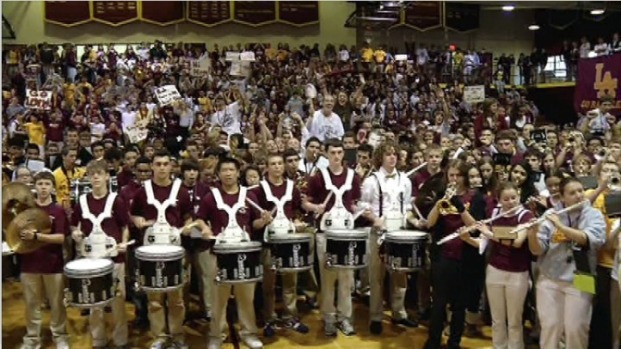 NBC 5 News Today featured Loyola Academy for Prep Destination of the week! Almost one thousand students rallied up at Loyola Academy's gymnasium to celebration Prep Destination Dance Friday with NBC 5 News Today! The bleachers were packed with Ramblers maroon and gold as they participated in an early morning Faculty vs. Student Basketball Game. The Ramblers and Lions will face off Saturday night at noon. Loyola Academy was established in 1909, with renowned individuals like NBC Today correspondent Mike Leonard, actor and comedian Bill Murray, and Hollywood film writer Jonathan Nolan, Loyola Academy Prep Destination of the Week will be one to remember. Think your school has what it takes? Every week, NBC 5 News Today will open voting polls beginning on Monday ending on Wednesday at noon to find out where you want to send our crew. After polls close on Wednesday, our team will head to the winning high school for an early-morning tailgate! Be sure to watch Monday morning as finalists are listed! Cast your Prep Destination vote on Facebook, and watch NBC 5 News Today on Thursday to see where we’ll head for that week.